Meal planning is always a major key to success in weight loss. Crock pot meals can be very beneficial in that regard, as they enable us to make several servings at a time with minimal effort. In 15 minutes you can assemble this recipe with oriental flavors and have a delicious meal waiting for you when you get home. Heat up fresh or frozen cauliflower rice and you can create a delicious meal. A serving of beef is the size of a deck of cards (3 oz), with your cooked vegetables equaling one cup. You can add more or less broccoli, depending on whether you use the cauliflower rice or not. Remember to have a serving of healthy fat and fruit to complete your meal! Add beef, coconut aminos/soy sauce, beef broth, Swerve/stevia, ginger, garlic, red pepper flakes and sea salt. Mix well and cook on low for 6 hours. 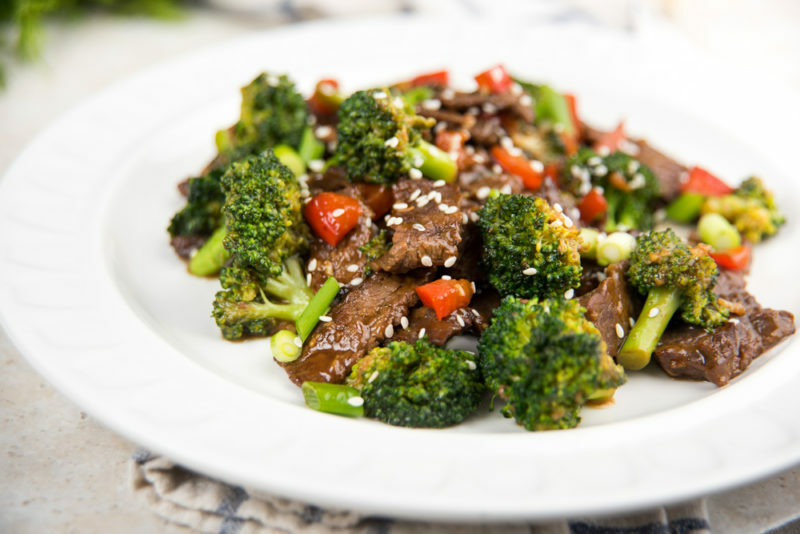 Add broccoli and red pepper, mix well, and continue cooking on low for 1/2-1 hour, depending on desired crispness. OPTION: If you can’t be home to add broccoli and peppers and wait for it to cook, you can always add the peppers in at the beginning. Cook your broccoli separately on top of the stove, then add it to the crockpot and mix. *Braggs Liquid Aminos are found in the healthy food department at most food chains and health food stores. Tamari is found either with the other soy sauces in the condiment aisle or also in the healthy food department.